One of the world’s wealthiest traders – and one of its most-respected philanthropists – has an interesting theory. BILLIONAIRE GEORGE SOROS delivered a speech in Trento, Italy yesterday on the Eurozone crisis and it’s an absolute dynamo. You really ought to read the whole speech, which is on his personal webpage, as it starts off with an overview of his economic theories (which revolve around the idea that markets are deeply imperfect and prone to turn into bubbles based on human fallibility and lack of knowledge) and then nicely explains how all of this explains the current crisis in Europe. What’s fantastic is that he really gets it from all angles. The process of integration was spearheaded by a small group of far sighted statesmen who practiced what Karl Popper called piecemeal social engineering. They recognised that perfection is unattainable; so they set limited objectives and firm timelines and then mobilised the political will for a small step forward, knowing full well that when they achieved it, its inadequacy would become apparent and require a further step. The process fed on its own success, very much like a financial bubble. That is how the Coal and Steel Community was gradually transformed into the European Union, step by step. Germany used to be in the forefront of the effort. When the Soviet empire started to disintegrate, Germany’s leaders realised that reunification was possible only in the context of a more united Europe and they were willing to make considerable sacrifices to achieve it. When it came to bargaining they were willing to contribute a little more and take a little less than the others, thereby facilitating agreement. At that time, German statesmen used to assert that Germany has no independent foreign policy, only a European one. The process culminated with the Maastricht Treaty and the introduction of the euro. It was followed by a period of stagnation which, after the crash of 2008, turned into a process of disintegration. The first step was taken by Germany when, after the bankruptcy of Lehman Brothers, Angela Merkel declared that the virtual guarantee extended to other financial institutions should come from each country acting separately, not by Europe acting jointly. It took financial markets more than a year to realise the implication of that declaration, showing that they are not perfect. This is a really huge point to grasp, because a nagging question has been: Why did the market think of Greece, Ireland, Portugal, Spain, etc, as being risk-free sovereigns at one point, and then decide that they were not risk free and subject to credit risk? Soros’ answer: because they were essentially risk-free so long as the arc was always towards more integration. That ended when Merkel made the declaration he says above. This is key. But the euro also had some other defects of which the architects were unaware and which are not fully understood even today. In retrospect it is now clear that the main source of trouble is that the member states of the euro have surrendered to the European Central Bank their rights to create fiat money. They did not realise what that entails – and neither did the European authorities. When the euro was introduced the regulators allowed banks to buy unlimited amounts of government bonds without setting aside any equity capital; and the central bank accepted all government bonds at its discount window on equal terms. Commercial banks found it advantageous to accumulate the bonds of the weaker euro members in order to earn a few extra basis points. That is what caused interest rates to converge which in turn caused competitiveness to diverge. Germany, struggling with the burdens of reunification, undertook structural reforms and became more competitive. Other countries enjoyed housing and consumption booms on the back of cheap credit, making them less competitive. Then came the crash of 2008 which created conditions that were far removed from those prescribed by the Maastricht Treaty. Many governments had to shift bank liabilities on to their own balance sheets and engage in massive deficit spending. These countries found themselves in the position of a third world country that had become heavily indebted in a currency that it did not control. Due to the divergence in economic performance Europe became divided between creditor and debtor countries. This is having far reaching political implications to which I will revert. 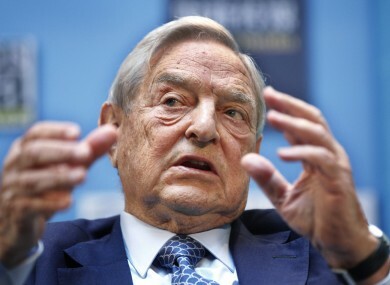 Email “George Soros: The eurozone crisis is all Merkel’s fault – and this is why”. Feedback on “George Soros: The eurozone crisis is all Merkel’s fault – and this is why”.